November 20, 2017 5:00 P.M.
Mayor Brian Linin called the meeting to order with Commissioner Gary Farris, Commissioner Gwen Mai and Commissioner John Garcia responding to roll call. Vice-Mayor Annette Fairbanks was reported absent. Also present were Rich Simon – Director of Public Works, Dustin Bedore – Director of Electric Utilities, Joni Showalter-Police Chief, Suzanne McClure – Economic Development Director, Mary Volk – City Clerk, and Andrew Finzen – City Manager. New Officer Introduction – Joni introduced new officer Erik Roeder. Corporal Promotions – Joni stated, there have been two promotions to Corporal in the department, Frankie Hayes and Jason Erhart. Officer Mader is our new Field Training Officer. Junior Commission: Turkey Shoot Out – Junior Commissioner’s Chelsea Phillips and Emily Whisnant informed the Commission of the fun activity planned to involve the entire community tomorrow at Maverick basketball game. We have a basketball shoot out with a twist to include SAFE program to promote seatbelt safety. Everyone is invited. Small Business Saturday Proclamation – Mayor Linin proclaimed Saturday November 25, 2017 as SMALL BUSINESS SATURDAY urging residents to support small businesses in community. Brick Street Contract: EBH – Adam stated, contract is for design engineering on the Transportation Alternative Project for 9th and 10th and Main Street. This is the same contract as in the past, adding decorative street lighting. Contract amount is the amount in application adding electrical engineering. Mayor Linin asked, why was there no electrical in last grant? Adam stated, I am uncertain, but the idea was discussed to get started with the project and KDOT did not deny it in application so we are planning to complete it. This contract is for design only, construction engineering goes through the State. ON A MOTION by Commissioner Mai to approve the brick street contract with EBH for design engineering in the amount of $38,500 seconded by Commissioner Garcia. MOTION carried on a VOTE of 4-0. December Holiday 10% Usage Discount – Andrew stated, in the past Commission has offered a 10% discount on electric consumption for December usage to encourage Holiday decorations. I recommend the Commission continue awarding discount for December electrical consumption. Mayor Linin stated, I feel this is a good thing, especially if it encourages citizens to display holiday spirit. ON A MOTION by Commissioner Garcia to authorize 10% discount to citizens for December electrical consumption seconded by Commissioner Farris. MOTION carried on a VOTE of 4-0. Airport Board – Mayor Linin stated, I asked Andrew to allow Commission to discuss who is applying for board appointments then make appointment at later meeting. Andrew stated, Stephanie Stephenson is rescinding her application. She is very passionate about the airport but did not want appearance of impropriety on board since there are enough applicants. We received four applications to consider for three vacancies. Commissioner Mai stated, currently there is no quorum on airport board at this time. Andrew stated, that is correct and City Code states Commission will take recommendation from board but there is no quorum. I contacted current board member Jon Yost regarding recommendations. Mayor Linin stated, a recommendation to me was that we appoint a member from hospital board since they use airport. Jon stated, John Topliff has a huge investment at airport and deserves a spot on board. Jonathon Collet is same way and flies for Eagle Med which may fulfill that recommendation if you want an individual from hospital on board. Both Ben Brandvik and Ben Schears will do a good job. Ben Schears is doing good things at college and maybe we can get them discussing flight school program again. Tree Board – Andrew stated, we received one application from Todd Trzcinski who is interested in serving. Currently this is a five person board with three members, Christy Rasure, Danny Krayca and Michael Bretz. The board normally assists with Arbor Day celebration then code outlines other interesting duties which they have not been able to do with vacancies. Ex-Officio Airport Board Member – Andrew stated, section 13-803 of City Code defines board membership as five Sherman County residents and a sixth member being an ex-officio member from the Governing Body. This is to serve as liaison to the Commission which would bridge some continuity and communication. I recommend appointing one of the Commissioner’s that remain after January to board. Commissioner Garcia stated, I am very busy and have no time to sit on board at this time; how long is appointment? Andrew stated, that is not outlined in code and I would say it would coincide with elections. Mayor Linin asked, how often do they meet? Andrew stated, the first Thursday of every month at 8:00 a.m. Mayor Linin stated, I believe we can think about it and take action on appointment at next meeting. Commissioner Mai stated, I believe it would also be good to have an ex-officio member on Cemetery Board. Mayor Linin stated, that is something to think about for the future. Commission Transition – Andrew stated, the League of Kansas Municipalities put on an event with this being the first November election cycle for municipalities. S.A. 25-21a01(b) states new Commissioner’s must be sworn in and Mayor/Vice-Mayor elected the second Monday in January or January 8, 2018 which conflicts existing meeting schedule. I recommend a couple options, changing Ordinance to have January meetings the first and second or the second and third Monday’s or scheduling a special meeting. If there is not a meeting on first Monday of the year, it poses issues processing yearend checks. We can have a special meeting on the second Monday to swear in new officials and elect Mayor/Vice-Mayor. Mayor Linin stated, meetings are scheduled this way to be able to conduct business; if there is no meeting on third Monday that is a long period of time without a meeting. Consensus of Commission is to schedule a special meeting on January 8th to swear in new officials and elect Mayor/Vice-Mayor. NWKTC Scholarship Program – Andrew stated, I provided you information on donation line item and what has been expended. One remaining item to be expended is the donation to NWTKTC and we are trying to determine how to proceed with that money. Commissioner Mai had an idea to setup a loan repayment program rather than a scholarship program to provide incentives to keep college graduates in Goodland. Mayor Linin stated, I like this approach. Commissioner Mai stated, I feel it should be an application process every year. If we do not have any applications we continue funding program to ensure program continues. Suzanne stated, this is similar to the Rural Opportunity Zone program the county funded in past. Commissioner Garcia stated, I do not feel this will do anything to stimulate the college. Commissioner Mai stated, the idea is encouraging those from Goodland to stay in community and create a business. Trying to be creative to use money, would like to have a plan to setup the program. Mayor Linin stated, I would like you to discuss program with Ben Schears at the college. Personnel Manual Amendments – Andrew stated, Article K-2 “Workplace Anti-Violence” conflicts with HB 2502. Only option is to repeal piece prohibiting conceal carry in public facility. Mayor Linin stated, basically this would allow employees to conceal carry in public building. Andrew stated, that is correct. Another modification that we need to make pertains to Mutual Aid call out compensation policy. Last winter we sent four employees to Oberlin to get infrastructure back up with winter snow storm. When we send them, they get reimbursed through FEMA but we need to layout a specific policy so we can educate requesting entity and our employee what they are getting. FEMA will not reimburse over sixteen hours worked per day. Compensation is eight hours at standard pay then overtime after that. Employees are paid minimum shift hours regardless if work less. Dustin also needs to address standby time. We were urged by KMU to put policy in black and white so employees know what will receive in pay. Mayor Linin asked, what about hotels and meals? Dustin stated, we sent Oberlin a bill to get reimbursed, then they get reimbursed by FEMA. Oberlin also reimbursed us for fuel and started the clock when our employees left Goodland. There may be times we need the help. Andrew stated, I will design policy for next meeting. Main Avenue Beautification – Andrew stated, Commissioner Mai wanted to look at ways to address green space downtown. She is looking at beautification of downtown in ways that are not cost prohibitive, maybe some trees or greenery. What we would be battling is overhead electrical and underground water lines. One way is using bump outs which would possibly take up one parking spot a block. Plan is to make it more appealing to be downtown. Commissioner Mai stated, I wish we could have had a plan before we started Main Street brick projects. I feel the Commission needs a plan of what want Main Street to look like. The trees add to downtown beautification. Now is the time to talk about it before the City gets too far into street projects, we can put a put a drip line in while the streets are open. Suzanne took over replacing Christmas lights and they look good but we need to carry that further. Mayor Linin asked, who would take care of these items? Andrew stated, City Staff took over watering planters Monday through Friday, the trees will not take a lot of time watering. Commissioner Mai stated, in January the Commission will have funds starting which will take it a long way and be a huge improvement to downtown. Adam stated, with this project we are four blocks into the Main Street plan. The Transportation Alternative Program also funds beautification projects so if the City wants to apply for street scape portion of project they would get 80% paid for if grant is approved. There are requirements if use grant funding for ADA ramps to businesses and such. Commissioner Garcia stated, we also talked about a sound system like Atwood has. Mayor Linin stated, maybe we should look at it with a grant project to see what is affordable. Adam stated, the City has beautification with this project so we will see how it works. Commissioner Garcia stated, Commissioner Mai said she wanted to do something with Commission funds available January 1, what about decorative lighting on corners? What would that cost? Commissioner Mai stated, I prefer starting with trees and as complete street projects, change out lighting. The trees we should consider are ornamental. City Managers Report- 1. We discussed temporary signs before the election and the flaws in our existing Code as it relates to temporary signage with a desire to fix code after the election. Unfortunately, this is becoming a bit more complicated than originally anticipated. 2015 Supreme Court ruling known as Reed vs. Town of Gilbert has challenged many communities trying to craft an ordinance. Salina made some modifications which have caused other issues with business signs. Resolving issue is challenging, no easy answer to address. It will be very problematic to enforce. Mayor Linin stated, this was a result of citizens concerned about the length of time political signs are up. I recommend we keep doing what we are doing so we do not get involved in a first amendment suit. Andrew stated, we will need to make a few changes but it will be easier. 2. Roof work has begun on 1008 Main and should be complete within two weeks. Commissioner Garcia asked, have you been in contact with owner? Andrew stated, he only wants to be contacted by email. Acquisition is not feasible. We have sent him information by mail and email that a contract has been awarded and to expect an invoice. 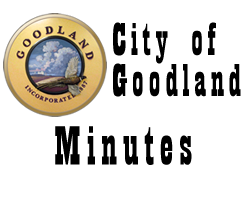 The City partnered with Goodland High School on November 15th for school’s cleanup event; they send students and faculty out in community to rake leaves then the City hauled leaves to the dump. We are thankful to Sherman County for waiving landfill fees for this event as well. 4. City Hall will be closed November 23 and 24 in observance of Thanksgiving. 5. November 29th from 8:00 a.m. to 12:00 p.m. in the Wolak Building is the Youth Entrepreneurial Challenge. Please stop by and see what the 9-12th graders have put together. 6. Suzanne and Joni have been working together to get signage ordered for the Police Department building, which currently does not have anything. We will be getting individual letters to spell out “POLICE” on the west side of the facility. 7. I will be putting together a City Commission retreat for late January or early February based on scheduling. This will allow the new Commission to discuss topics of interest and do some goal setting. I will have more information on this in the coming weeks. 8. The Goodland High School government classes will be at City Hall on November 28th to learn more about City government operations. Commissioner Mai – 1. Have we seen any NRP applications yet? Andrew stated, we will not see them until January 1, 2018; Sherman County goes through applications until then. 2. Shout out to Josh Doke on the movie Goodland. I hope everyone gets out to see it, he compliments the City on accommodations. 3. Thank you to Dustin for putting up Christmas lights for parade. 4. I ask everyone to support local small businesses during holiday season. Commissioner Farris – 1. Christmas lights look good. They are not working at the VanGogh. Dustin stated, a contactor was burnt up but was fixed this morning. Vice-Mayor Fairbanks – 1. Absent, No Report. Commissioner Garcia – 1. Thank you to the Electric Department on decorations and extending wreaths south on Highway 27. 2. There is a shop local campaign going on right now. 3. An existing business owner called to inquire about incentives for existing businesses in addition to new businesses. I told her that would be opening can of worms because everyone would be applying for incentives. I informed her that incentives were created to stimulate new businesses, but that I would discuss the idea with Commission. Mayors Report – I echo comments of other Commissioners on decorations. 2. Congratulations to Goodland High School Cheerleaders for eighth place finish at State Competition. ADJOURNMENT WAS HAD ON A MOTION Commissioner Garcia seconded by Commissioner Farris. Motion carried by unanimous VOTE, meeting Adjourned at 6:25 p.m.